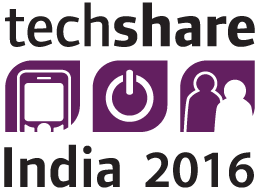 Techshare India 2016 included an exhibition of accessibility & assistive technology across a range of disabilities. The exhibition aimed at creating awareness about the latest and best assistive technology products and services that are available for people with disabilities in India.The exhibition area was be open to the public and was FREE for everyone to visit and view. Launch of NewzHook app and website: the first ever news portal for persons with disability. Over 2000 visitors on Day 1 and over 1500 visitors on Day 2 including disabled, caretakers, elderly etc.